If you are looking for effortless powder turns, the brand-new Shorty is your board. The Tip-Tail-Rocker with low camber gives you perfect buoyancy and balance in powder. The hook-free Diamond Tail makes turning extremely easy in packed snow. The ash and poplar wood core redefines your performance level, allowing precise control on every terrain, and carbon stringers guarantee torsional stiffness for better rebound and solid edge use. The extra thin nose section helps with easy direction changes in deep snow. We build our longboards with classic camber and Tip-Tail-Rocker. We distinguish between standard camber and low camber: with low camber, the centre of the board is slightly elevated and the contact points are further towards the centre. The Shorty has 6 mm camber and is the easiest to manoeuvre board in our range. The Shorty features the Diamond Tail, a hook-free design combined with a longer nose for the powder performance of a bigger board – Volume Economy Tech. Basically, it’s 180-plus board packed into an easy handling 169 cm. The result is a forgiving and playful design with plenty of performance when you need it. After a great 40 day come back season on my Pipeliner out in Montana, I didn’t think I’d be wanting or needing another board anytime soon…until I saw the SHORTY 169cm. I’m the kind of rider that can go over the nose of any board under 170cm pretty easily, for better of for worse, but something about the SHORTY looked right to me and I was looking for a ride like the Pipeliner but one that could take on even tighter trees. My first day on my new SHORTY felt like it was a board I loved because I had already been riding it a lot–comfortable out of the box. The SHORTY is super agile but holds an edge on anything like a champ and I never feel like I’m going over the nose because of longer nose rocker than most boards. When you want SHORTY to ride like an even longer and bigger board, it does. I love this board in all conditions, especially in powder and slashing it. I think the SHORTY rules so hard because of its carving inspired sidecut, its powder nose and its long nose rocker that starts from way back by your foot, it keeps you always floating–so cool! This design is amazing. And the more low profile tail is built for speed and smooth carve releases. Brilliant board, “quiver killer” is indeed an apt moniker for the SHORTY! So fun to ride! Props yet again Mats! P.S. 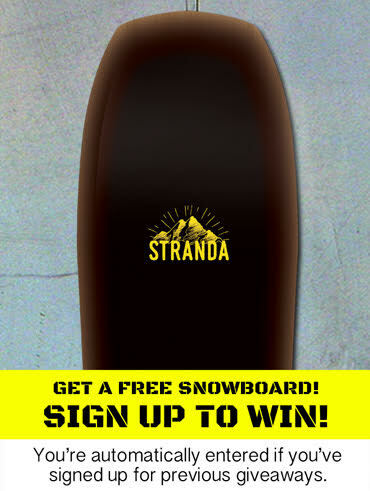 These boards are addicting, I want all the Stranda shapes even if Shorty is the quiver killer. I’m having a great time riding this board! At 169cm, it’s a short board in comparison to the rest of my quiver. The Shorty is billed as a high speed untracked powder board. Unfortunately this winter hasn’t delivered the goods yet… But my local resort had some fresh snow these past few days, and I had a blast carving and making short pow turns, and going through trees. I haven’t read all the technical specs, so I’ll just describe it as I see it. The board is relatively stiff, has camber between the feet, some tail rocker, and a big rockered shovel nose. The sidecut doesn’t reach all the way in the front — so when I’m carving, I can see the nose ready to grab the fresh snow and to lift me to the top. The SCR feels long — maybe 11m? The board is very stable at speed, and I had some huge fast turns today on it — building speed to shoot up and over into the powder in the trees along the slope. Super fun. With the shorter tail I can turn it on a dime, so surfing narrow lanes of untracked powder, slaloming around trees, it’s a joy.